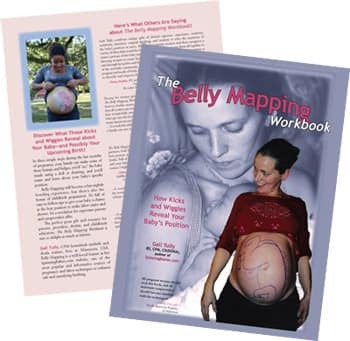 Belly Mapping teaches a pregnant woman to tell her baby’s position for herself – during the last month or two of pregnancy. Too often, the posterior (sunny-side up) baby isn’t identified until labor is troubled. Mothers ask, sometimes after a cesarean was done for a long, OP (baby in th eposterior position) labor, “Why didn’t anybody know? Can’t the nurse or doctor tell when doing an exam?” Trying to feel fetal head position with an internal exam can be challenging. Fortunately, other clues exist. Click here to go to the entire Baby Positions section for details on fetal positions. Belly Mapping is a three-step process for identifying baby’s position in the final months of pregnancy. Parents can use Belly Mapping for their own enjoyment. Medical care givers can enhance their skills by using the visual clues of Belly Mapping. Doulas will be able to suggest strategies for fetal repositioning when a posterior lie is suspected. Visit Belly Mapping on Facebook and tell us your experience with this activity! !